Guide on the different options to reach the town of Amalfi from Ischia including hydrofoils and connections with Sorrento and Capri. The two most-visited locations on the Amalfi Coast are Positano and Amalfi. There are various ways to reach both towns from Ischia. The options to reach Amalfi are almost identical to those detailed on the how to get to Positano from Ischia page but with some subtle differences including longer journey times. On Thursdays and Sundays only you can take the day-trip excursion offered by Ischia Cruises which leaves from Ischia Porto, Forio, Lacco Ameno and Casamicciola. You can buy a single ticket from Ischia to Amalfi but please be aware that the boat will first stop in Positano for two hours before continuing on to Amalfi which takes a further 30 minutes or so. Please see green button below for further details. The direct service from Ischia to Amalfi ​is available every day of the week from June 15th to September 15th. The hydrofoil leaves Ischia Porto at 16:20 and arrives in Amalfi at 18:55, a journey time of just over 2 and a half hours. As with Option 1, this service stops first at Positano before moving on to Amalfi but this is a much shorter stop, just for the Positano passengers to get off and the new passengers to Amalfi to get on so around 5 - 10 minutes. At the time of writing we're still waiting for confirmation that Alicost will be providing this service in 2018 but we do expect that to be the case. Please use the green button for more information on this option. 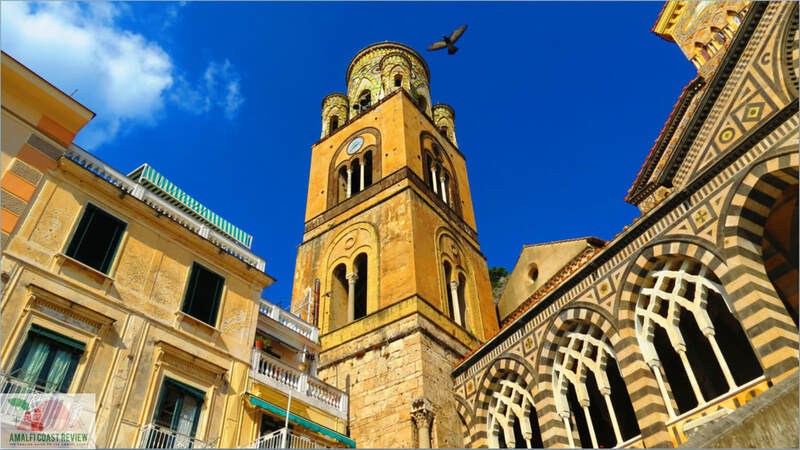 If you wish to travel from Ischia to Amalfi outside of the peak times (June 15th to September 15th) and not on a Thursday or Sunday then you can travel via Sorrento. From Easter until the end of October there's a daily hydrofoil from Ischia to Sorrento leaving at 10:30am and arriving an hour later. Once you get to Amafi you have a choice between bus and taxi. The bus journey takes around an hour and 3 quarters while the taxi will be slightly faster but considerably more expensive. If you're looking for a private transfer from Ischia to Amalfi we can offer the service. Just drop us a line at info@ischiareview.com, letting us know the travel dates and number of passengers. We'll then get back to you with a price quote. For further details on the hydrofoil from Ischia to Sorrento please use the following green button. If you're planning to travel to Amalfi in the morning and not on a Thursday or Sunday you can take the morning crossing to Capri, spend the day there and than sail across to Amalfi in the afternoon/evening. The benefit here is that you don't need to take the long bus journey or expensive taxi from Sorrento to Amalfi. For this option you can take the daily 10:30 hydrofoil (Easter to end of October only) from Ischia to Capri. This is in fact the same, Alilauro hydrofoil that then sails on to Sorrento but Capri is the first stop around 11:15. Once you get to Capri you can leave your luggage at one of the various baggage deposits in Marina Grande which is the port of arrival from Ischia and the main port on the island. There are two crossings in the afternoon/evening from Capri to Amalfi. One at 16:25 operated by Alilauro stopping first in Positano and arriving in Amalfi at 17:45 (journey time 1 hour 25 minutes), and another operated by NLG leaving Capri at 17:15 and getting to Amalfi at 18:15, also stopping first in Positano but with a total journey time of 25 minutes less. Please see green buttons for further details on the above option.